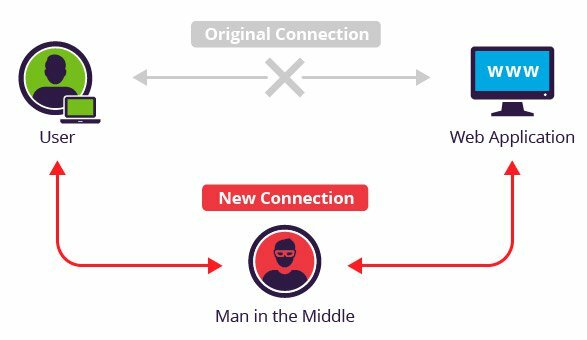 Successful MITM execution has two distinct phases: interception and decryption. The first step intercepts user traffic through the attacker’s network before it reaches its intended destination. The most common (and simplest) way of doing this is a passive attack in which an attacker makes free, malicious WiFi hotspots available to the public. Typically named in a way that corresponds to their location, they aren’t password protected. Once a victim connects to such a hotspot, the attacker gains full visibility to any online data exchange. IP spoofing involves an attacker disguising himself as an application by altering packet headers in an IP address. As a result, users attempting to access a URL connected to the application are sent to the attacker’s website. ARP spoofing is the process of linking an attacker’s MAC address with the IP address of a legitimate user on a local area network using fake ARP messages. As a result, data sent by the user to the host IP address is instead transmitted to the attacker. DNS spoofing, also known as DNS cache poisoning, involves infiltrating a DNS server and altering a website’s address record. As a result, users attempting to access the site are sent by the altered DNS record to the attacker’s site. HTTPS spoofing sends a phony certificate to the victim’s browser once the initial connection request to a secure site is made. It holds a digital thumbprint associated with the compromised application, which the browser verifies according to an existing list of trusted sites. The attacker is then able to access any data entered by the victim before it’s passed to the application. SSL hijacking occurs when an attacker passes forged authentication keys to both the user and application during a TCP handshake. This sets up what appears to be a secure connection when, in fact, the man in the middle controls the entire session. SSL stripping downgrades a HTTPS connection to HTTP by intercepting the TLS authentication sent from the application to the user. The attacker sends an unencrypted version of the application’s site to the user while maintaining the secured session with the application. Meanwhile, the user’s entire session is visible to the attacker. Blocking MITM attacks requires several practical steps on the part of users, as well as a combination of encryption and verification methods for applications. Avoiding WiFi connections that aren’t password protected. Paying attention to browser notifications reporting a website as being unsecured. Immediately logging out of a secure application when it’s not in use. Not using public networks (e.g., coffee shops, hotels) when conducting sensitive transactions. For website operators, secure communication protocols, including TLS and HTTPS, help mitigate spoofing attacks by robustly encrypting and authenticating transmitted data. Doing so prevents the interception of site traffic and blocks the decryption of sensitive data, such as authentication tokens. MITM attacks often occur due to suboptimal SSL/TLS implementations, like the ones that enable the SSL BEAST exploit or supporting the use of outdated and under-secured ciphers. To counter these, Imperva provides its customer with an optimized end-to-end SSL/TLS encryption, as part of its suite of security services. Hosted on Imperva content delivery network (CDN), the certificates are optimally implemented to prevent SSL/TLS compromising attacks, such as downgrade attacks (e.g. SSL stripping), and to ensure compliancy with latest PCI DSS demands. Offered as a managed service, SSL/TLS configuration is kept up to date maintained by a professional security, both to keep up with compliency demands and to counter emerging threats (e.g. Heartbleed). Finally, with the Imperva cloud dashboard, customer can also configure HTTP Strict Transport Security (HSTS) policies to enforce the use SSL/TLS security across multiple subdomains. This helps further secure website and web application from protocol downgrade attacks and cookie hijacking attempts.